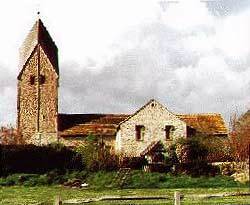 The Church of St. Mary in Sompting is one of the most striking examples of Anglo-Saxon architecture in all of England. Its primary distinguishing feature is the Rhenish Helm or Rhineland Helmet of the tower. This is the only known example of this style with roots in the Anglo-Saxon period. See the detailed essay for more information. The date of construction is not known, but the church was mentioned in the Domesday Book compiled under the direction of William the Conqueror in 1086. By 1154 the church had been granted to the Order of the Temple of Solomon in Jerusalem, more commonly known as the Knights Templar. The Knights Templar rebuilt the nave and chancel on the original Saxon plan. They also added the present north and south transepts in about 1180. By 1324 a series of political events put the Order of theKnights of the Temple of Jerusalem in a precarious political position. The Pope had formally dissolved the Templar Order and decreed that their property must be transferred to another order of Crusaders. In 1324 Edward II formally transferred the property of the Knights Templar to the Order of the Knights of the Hospital of St. John of Jerusalem, often known as the Knights of St. John or the Hospitallers. By 1540 the tides had turned against the Hospitallers. The Reformation Parliament of Henry VIII dissolved the Order of the Hospital of St. John in 1540. The much of the Church at Sompting fell into ruin. In 1963 Major G.N. Tristram presented the patronage of the Church of St. Mary to the re-founded order of the Hospital of St. John. © Stephanie James 2003. All Rights Reserved.